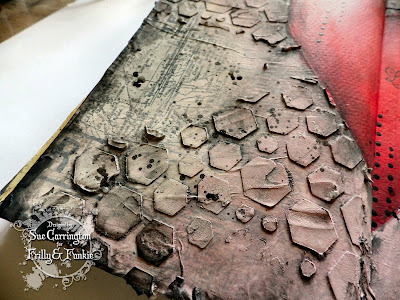 Stamping Sue Style: A lesson learnt ! With Valentines this weekend I've chosen "LOVE IS IN THE AIR" as the challenge theme. Create a vintage or shabby chic project with love as the central theme. Think hearts, cupid, love and romance in whatever colour palette your heart desires. Now at this point you may be wondering what the title has to do with the challenge theme. Well I was happily taking photos at each step of my journal page and had seen a different symbol on the display of my camera but didn't think anything of it at first. Then I wondered would the camera still take photos if there was no memory card in it........yes you guessed it, it will ! So all the wonderful step x step photos are lost ! 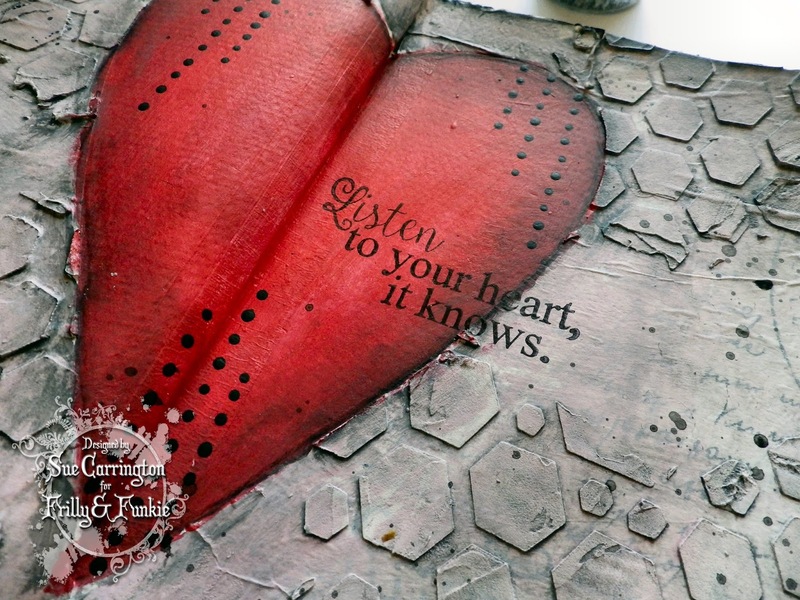 So, the first step was to fold a piece of Tim Holtz Tissue Wrap in half and draw a heart shape, which I cut out. 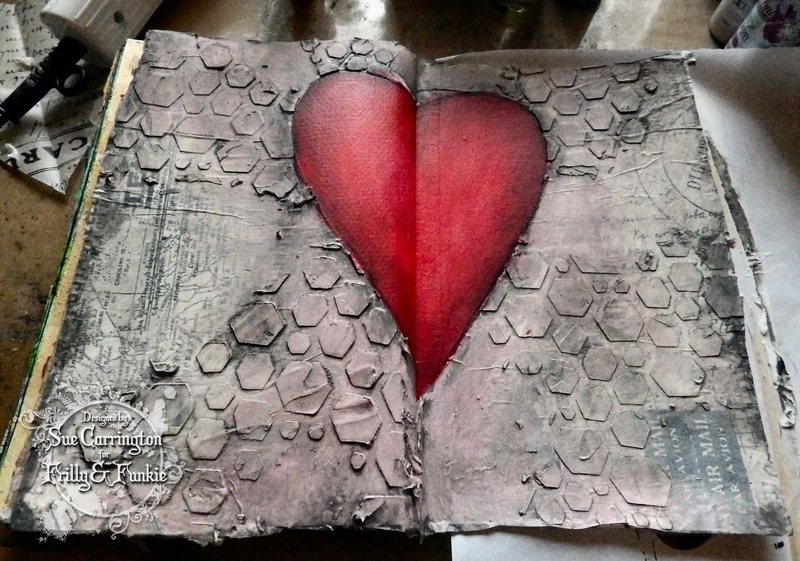 The paper was then glued onto the pages keeping the cut out heart in the cetnre. I then used the Dylusions hexagon stencil with Ranger Texture Paste. Once dry I started to build up layers of acrylic paint. When the paint was dry I mixed Slate Fresco Finish with satin glaze and painted it over all of the pages but not the heart. I left it for approximately a minute then wiped it off using a baby wipe. This created the grungy effect I was afer. I then painted the heart, starting with a pale red and builing up the layers and using Slate around the edges to add more depth. The dots are created using the end of a paint brush dipped in Little Black Dress Fresco Finish paint. I wanted more definition around the heart so grabbed my Stabilo pencil and drew around it and with a damp paint brush blended the pencil. I still needed more gunge so I mixed some Little Black Dress Fresco Finish with water and splattered the page ! The sentiment is from one of the fabulous Yvonne Blair stamps. The actual stamp has alot more words on it but the section above spoke to me, so I masked off the rest of the words so I could use just this section. Fantastic journal pages! The paste texture is wonderful and so industrial feeling. Beautiful pop of red with that wonderful heart! I love the way this heart appears to be beating out of the page. The color contrast is just wonderful! I love all the texture, too. Sorry about the camera....that would have been a fabulous step out! Ugh! I feel your pain....I have totally done that, not once but twice! Now before I even turn the camera on, I check for the memory card. 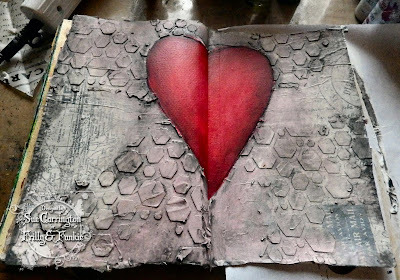 This is an amazing journal page....love the amazing textures and the paint effects are lovely!Thank you for the inspiratio, Sue! 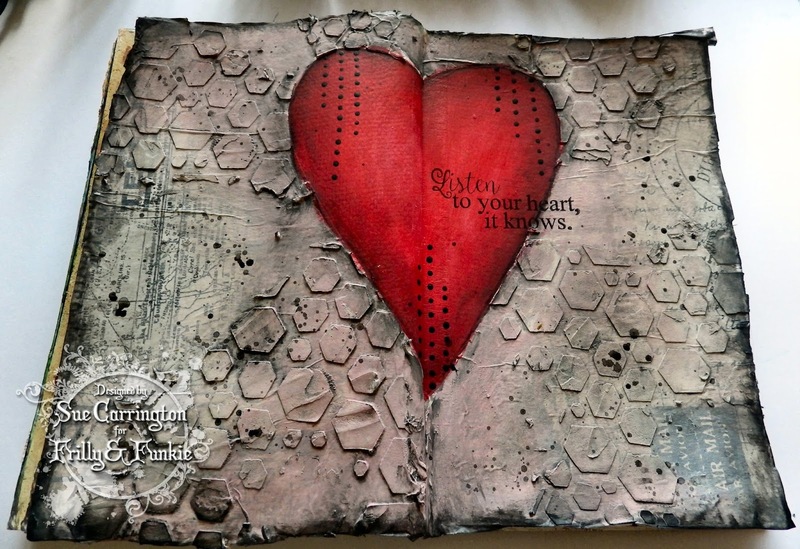 what wonderful texture on your pages Sue - and the burst of red with the heart is really stunning! love the sentiment! Love that thick, lovely texture with the simplicity of your brilliant red heart Sue. This turned out sooo wonderful. j. Wonderful layers and texture. A love heart for sure. Oh, how I adore that grungy textured background, and I've just put that stencil at the top of my list! Wonderful painting on your heart! Great journal pages! Spritz, Splatter and Smoosh !